USED Kingship YACHTS FOR SALE | Kingship YACHT BROKER : Atlantic Yacht & Ship, Inc.
Taiwan-based shipyard Johnson Yachts, well known for their progressive and distinctive yacht designs, has been building exceptional vessels since 1987. Very much a design led company, Johnson Yachts is partnered with Dixon Yacht Design, who has designed all the vessels produced at the respected shipyard for the almost three decades of its existence. The combination of Dixon Yacht Design’s styling and naval architecture and the exceedingly high quality workmanship from Johnson Yachts has made the company the international success it is today. From the first vessel they produced to their latest endeavor, the forthcoming superyacht Johnson 125, Johnson Yachts has demonstrated a commitment to quality and solid workmanship that has led to their becoming one of Taiwan’s foremost yacht builders and a major player in the mega yacht segment. The key component of Johnson Yachts’ history of success is the dynamic partnership between Johnson Yachts and Dixon Yacht Design. Johnson Yachts was one of the first companies in the Far East to employ a European designer, a bold move that has paid off handsomely for the shipyard. Dixon Yacht Design got its start 27 years ago, when renowned English naval architect Bill Dixon stepped into the leadership of Angus Primrose Design following the untimely death of Angus. Soon after changing the trading name to Dixon Yacht Design, Dixon’s design team began designing the Mediterranean range of sleek Johnson Motor Cruisers. The synergy between Dixon Yacht Design and Johnson Yachts, born out of a mutual respect for each other’s abilities developed over their many years of working together, has produced a line of exceptional vessels. The result of this close working partnership can be seen in every yacht the shipyard produces, with Dixon’s innovative designs ably brought to life by the renowned skill of Johnson Yachts’ dedicated boat builders and engineers. One of the landmark yachts produced by Johnson was the Johnson 63, designed in the late 80’s. It was a radically designed boat even by European standards; for a Taiwanese boat building company like Johnson Yachts to have the confidence to build this design was a real turning point for the company as well as a seed change for the whole of the Taiwanese boat industry. 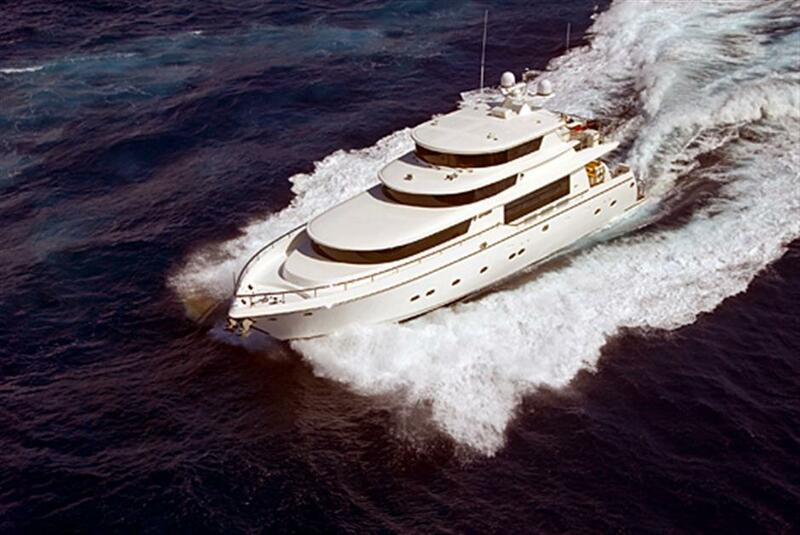 Johnson Yachts currently offers a fleet of distinctive Motor Cruisers ranging from 65’ to 125’ length. The successful partnership of Johnson Yachts and Dixon Yacht Designs, which so ably blends European design and Far East build quality, is on track to continue for years to come. Are you interested in obtaining a high quality Johnson Yacht of your own? Atlantic Yacht & Ship is delighted to offer Bella Donna, a wonderful 87’ Johnson 2008 for sale. Demonstrating the spacious feel that Johnson Yachts are known for, Bella Donna features a wide beam that provides a very voluminous interior. Her day areas and 4 luxurious staterooms are generously proportioned as are the operational areas of the yacht. Setting this particular Johnson Yacht apart is a Skylounge in lieu of the open flybridge, which provides a perfect area for visiting in comfort while enjoying a panoramic view of the surroundings. Easy to see in Ft. Lauderdale, FL, Bella Donna is asking $3,698,000 USD. Contact Brad Nelson at 954-205-7944 or email him at brad@ayssales.com for more information. For more than 53 years, Atlantic Yacht and Ship has been a leader in the South Florida yacht and ship brokerage industry. Whether you are interested in selling, trading, or buying a yacht, our experienced yacht brokers can help you with every step of the transaction. Contact Atlantic Yacht & Ship today at 954.921.1500 or click here and let our experienced brokers help you find the vessel of your dreams!